H.W. Brands' book "Heirs of the Founders"
New York Times bestselling historian H. W. Brands’ latest book is “Heirs of the Founders: The Epic Rivalry of Henry Clay, John Calhoun and Daniel Webster, The Second Generation of American Giants” It tells the riveting story of how, in nineteenth-century America, a new set of political giants battled to complete the unfinished work of the Founding Fathers and decide the future of our democracy. In the early 1800s, three young men strode onto the national stage, elected to Congress at a moment when the Founding Fathers were beginning to retire to their farms. Daniel Webster of Massachusetts, a champion orator known for his eloquence, spoke for the North and its business class. Henry Clay of Kentucky, as dashing as he was ambitious, embodied the hopes of the rising West. South Carolina’s John Calhoun, with piercing eyes and an even more piercing intellect, defended the South and slavery. 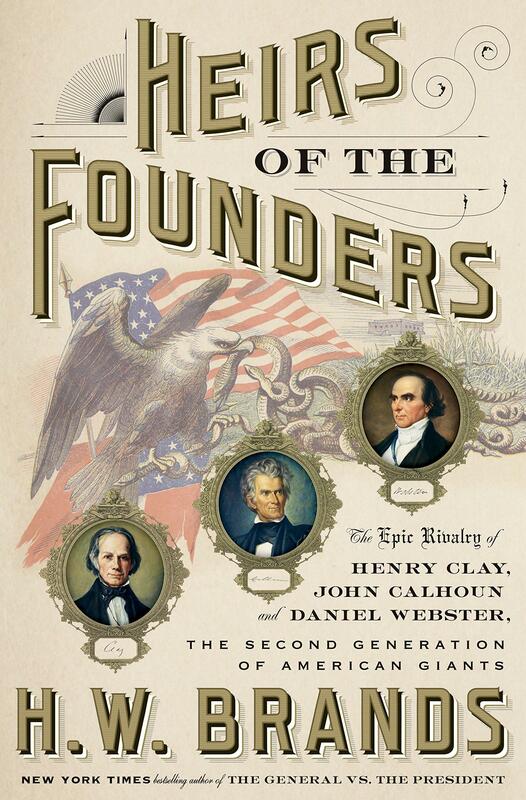 Together these heirs of Washington, Jefferson and Adams took the country to war, battled one another for the presidency and set themselves the task of finishing the work the Founders had left undone. Their rise was marked by dramatic duels, fierce debates, scandal and political betrayal. Yet each in his own way sought to remedy the two glaring flaws in the Constitution: its refusal to specify where authority ultimately rested, with the states or the nation, and its unwillingness to address the essential incompatibility of republicanism and slavery. They wrestled with these issues for four decades, arguing bitterly and hammering out political compromises that held the Union together, but only just. Then, in 1850, when California moved to join the Union as a free state, “the immortal trio” had one last chance to save the country from the real risk of civil war. But, by that point, they had never been further apart. H.W. Brands on Access Utah. Henry William Brands holds the Jack S. Blanton Sr. Chair in History at the University of Texas at Austin. He writes on American history and politics, and his books include “The Man Who Saved the Union,” “Andrew Jackson,” “The Age of Gold,” and “TR”. Several of his books have been bestsellers; two, “Traitor to His Class” and “The First American,” were finalists for the Pulitzer Prize. Brands lectures frequently on historical and current events and can be seen and heard on national and international television and radio. Throughout its history, America has been defined through maps. Whether made for military strategy or urban reform, to encourage settlement or to investigate disease, maps invest information with meaning by translating it into visual form. They capture what people knew, what they thought they knew, what they hoped for, and what they feared. As such they offer unrivaled windows onto the past. Today on Access Utah, as a part of “Our Favorite Books” series, we celebrate the 100th anniversary of the publication of Willa Cather’s “My Antonia.” Tom Williams’ guests include Cather scholars and USU professors Evelyn Funda and Steve Shively. Funda says that “My Antonia” is fresh and contemporary and raises issues about immigration, assimilation, class and female power that resonate today. We also talk about Funda’s mother, also named Antonia, who escaped her native Czechoslovakia in 1955 as the Communist Iron Curtain closed in. The editors of The Atlantic write: “The election of Donald Trump … [has] driven many Americans to rummage through history in search of context and understanding. Trump himself has been compared to historical figures ranging from Ronald Reagan to Henry Ford, and from Andrew Jackson to Benito Mussolini.